A community is a social group sharing an environment, normally with shared interests. In human communities, intent, belief, resources, preferences, needs, risks and a number of other conditions may be present and common, affecting the identity of the participants and their degree of cohesiveness. Human beings, like many other species, are essentially social beings, and naturally form communities which often develop into more structured societies. Human beings have the desire and need to be in close contact with others. Beginning with the family, human life is one of interdependence and sharing of physical, mental, and spiritual elements. Community can take many forms, from the intimacy of the family in the home, to the wide-ranging international community of multinational corporations, and to the virtual world of the internet. Each satisfies the need to interact with others in different ways, providing support to each individual in achieving their goals, and satisfying their desire to share with others. As people develop wider communities, with increasing diversity, throughout the world, a global community of peace and prosperity for all progresses closer to reality. The word community is derived from the Latin communitas (meaning the same), which is in turn derived from communis, which means "common, public, shared by all or many." Communis comes from a combination of the Latin prefix con- (which means "together") and the word munis (which has to do with performing services). Geographic communities: Range from the local neighborhood, suburb, village, town or city, region, nation, or even the planet as a whole. These refer to communities of location. Communities of culture: Range from the local clique, sub-culture, ethnic group, religious, multicultural, or pluralistic civilization, or the global community cultures of today. They may be included as communities of need or identity, such as disabled persons or elderly people. Community organizations: Range from informal family or kinship networks, to more formal incorporated associations, political decision making structures, economic enterprises, or professional associations at a small, national, or international scale. Communities are nested; one community can contain another—for example a geographic community may contain a number of ethnic communities. A municipality is an administrative local area generally composed of a clearly defined territory and commonly referring to a town or village. Although large cities are also municipalities, they are often thought of as a collection of communities, due to their diversity. A planned community is one that was designed from scratch and grew up more or less following the plan. Several of the world's capital cities are planned cities, notably Washington, D.C., in the United States, Canberra in Australia, and Brasília in Brazil. It was also common during the European colonization of the Americas to build according to a plan either on fresh ground or on the ruins of earlier Amerindian cities. In some contexts, "community" indicates a group of people with a common identity other than location. Members often interact regularly. A common example is a "professional community" is a group of people with the same or related occupations. Some of those members may join a professional society, making a more defined and formalized group. These are also sometimes known as communities of practice. A retirement community is designated and at least usually designed for retirees and seniors—often restricted to those over a certain age, such as 55. It differs from a retirement home, which is a single building or small complex, by having a number of autonomous households. An intentional community is a deliberate residential community with a much higher degree of social interaction than other communities. 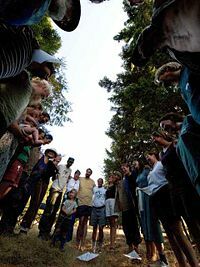 The members of an intentional community typically hold a common social, political or spiritual vision and share responsibilities and resources. Intentional communities include Amish villages, ashrams, cohousing, communes, ecovillages, housing cooperatives, kibbutzim, and land trusts. A virtual community is a group of people primarily or initially communicating or interacting with each other by means of information technologies, typically over the Internet, rather than in person. These may be either communities of interest, practice, or communion. Two traits are particular to virtual communities: Deception and anonymity. Because users rarely meet face to face, people are free to adopt personas online that do not accurately represent their real life (for instance, someone may claim to be a millionaire while they actually live in squalor). Along the same lines, anonymity gives users license to express themselves differently than they would in real life. Members of virtual communities often release their inhibitions and post harsh comments, overtly sexual material, or other such things out of line with their "real life" personality. Virtual communities are often criticized as being anti-social and a negative stereotype has developed of those perceived the spend too much time online. Despite this common perception, the internet can in fact have positive effects on one's social capital. The internet makes it possible to develop communities among those with parochial or obscure interests, where this would be impossible before due to the distance between participants. These may not be physical communities, but members of virtual communities certainly feel the same range of emotions for their fellow community members as do members of physically proximate communities. An eleven-member wolf pack in Yellowstone National Park, with the alphas leading and the omega in the rear. Many non-human species live in communities as well. These range from insects up through large mammals, such as whales. The structure of these communities varies, as does the level of cohesion. Some examples of non-human communities include ant colonies, beehives, wolf packs, schools of fish, and pods of dolphins. Bees and ants, for example, have strictly regimented roles within their societies. Wolves, too, function as social predators and hunt in packs organized according to strict, rank-oriented social hierarchies. It was originally believed that this comparatively high level of social organization was related to hunting success, and while this may be true to a certain extent, emerging theories suggest that the pack has less to do with hunting and more to do with reproductive success. Some big cats, such as tigers and leopards, tend to be solitary animals, eschewing community for solitary hunting. Others, such as lions, travel in packs with a clear leadership hierarchy. The process of learning to adopt the behavior patterns of the community is called socialization. The most fertile time of socialization is usually the early stages of life, during which individuals develop the skills and knowledge and learn the roles necessary to function within their culture and social environment. For some psychologists, especially those in the psychodynamic tradition, the most important period of socialization is between the ages of one and ten years of age. But socialization also includes adults moving into a significantly different environment, where they must learn a new set of behaviors. Psychology, as the scientific study of mental processes and behavior, is concerned about the interaction between individuals within communities. Those factors that motivate individuals into forming community, what incentives they have as members of a community, how it affects their identity and sense of self, are all important subjects touched upon by psychologists. Psychologists also study why community is necessary to people. Human beings are social animals, and while study of the resulting society may also be of interest to other social scientists such as sociologists and economists, the initial need to socialize with other humans is a psychological one. German sociologist Ferdinand Tönnies presented a concise differentiation between the terms "community" (Gemeinschaft) and "society" (Gesellschaft). In his 1887 work, Gemeinschaft und Gesellschaft, Tönnies argued that "community" is perceived to be a tighter and more cohesive social entity within the context of the larger society, due to the presence of a "unity of will." He added that family and kinship were the perfect expressions of community, but that other shared characteristics, such as place or belief, could also result in gemeinschaft. During human growth and maturation, people encounter sets of other individuals and experiences. Infants encounter first their immediate family, then extended family, and then local community (such as school and work). They thus develop individual and group identity through associations that connect them to life-long community experiences. As people grow, they learn about and form perceptions of social structures. During this progression, they form personal and cultural values, a world view and attitudes toward the larger society. Gaining an understanding of group dynamics and how to "fit in" is part of socialization. Individuals develop interpersonal relationships and begin to make choices about whom to associate with and under what circumstances. During adolescence and adulthood, the individual tends to develop a more sophisticated identity, often taking on a role as a leader or follower in groups. If an individual develops the feeling that they belong to a group, and they must help the group they are part of, then they develop a sense of community. If community exists, both freedom and security exist as well. The community then takes on a life of its own, as people become free enough to share and secure enough to get along. The sense of connectedness and formation of social networks comprise what has become known as social capital. Social capital is defined by Robert D. Putnam as "the collective value of all social networks (who people know) and the inclinations that arise from these networks to do things for each other (norms of reciprocity)." Social capital in action can be seen in groups of varying formality, including neighbors keeping an eye on each others' homes. However, as Putnam notes in Bowling Alone: The Collapse and Revival of American Community (2000), social capital has been falling in the United States. Putnam found that over the past 25 years, attendance at club meetings has fallen 58 percent, family dinners are down 33 percent, and having friends visit has fallen 45 percent. Western cultures are thus said to be losing the spirit of community that once were found in institutions including churches and community centers. Sociologist Ray Oldenburg states in The Great Good Place that people need three places: 1) The home, 2) the office, and, 3) the community hangout or gathering place. With this philosophy in mind, many grassroots efforts such as The Project for Public Spaces are being started to create this "Third Place" in communities. They are taking form in independent bookstores, coffeehouses, local pubs and through many innovative means to create the social capital needed to foster the sense and spirit of community. Community and its features are central to anthropological research. Cultural anthropology is the study of communal cultures. Following from this field is cross-cultural studies, which look at the differences in culture or community structure across different communities. 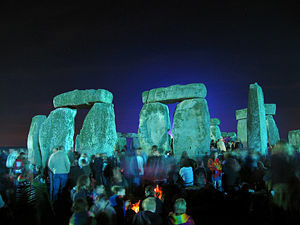 Archaeology studies historical communities no longer in existence. Within these fields are more specific subfields over which there exists a fair amount of overlap. Some of these subsets include anthropology of religion, urban anthropology, ethnic and racial studies, the study of virtual communities, ecological anthropology, and psychological anthropology. Much of philosophy has been focused on how people interact with one another. Some philosophers, such as Thomas Hobbes and Jean Jacques Rousseau, believed people live under social contracts with one another in order to prevent them from committing harm to each other. Karl Marx and conflict theorists believed there to be a perpetual struggle among groups within a community. Another strain of social philosophy is Communitarianism. Communitarianism as a group of related but distinct philosophies (or ideologies) began in the late twentieth century, opposing classical liberalism and capitalism while advocating phenomena such as civil society. Not necessarily hostile to social liberalism, communitarianism rather has a different emphasis, shifting the focus of interest toward communities and societies and away from the individual. The question of priority, whether for the individual or community, must be determined in dealing with pressing ethical questions about a variety of social issues, such as health care, abortion, multiculturalism, and hate speech. Analyzing communities within businesses often deals with the study of bureaucracy, especially as multinational corporations play a larger role in global affairs. These businesses can have very distinct cultures across their global operations or even within one country's offices. Certain offices may have a more casual approach to business whereas others expect grinding hours and formality from their employees. Maintaining a consistent community feel across offices is a challenge to many of these global businesses, which many attempt to solve through global connectivity events and the dissemination of strict memoranda on company values. Effective communication practices in group and organizational settings are important to the formation and maintenance of communities. How ideas and values are communicated within communities are important to the induction of new members, the formulation of agendas, the selection of leaders and many other aspects. Organizational communication is the study of how people communicate within an organizational context and the influences and interactions within organizational structures. Group members depend on the flow of communication to establish their own identity within these structures and learn to function in the group setting. Although organizational communication, as a field of study, is usually geared toward companies and business groups, these may also be seen as communities. The principles of organizational communication can also be applied to other types of communities. 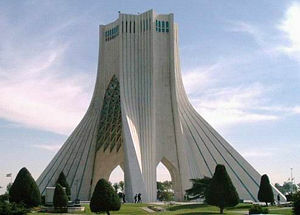 Azadi Tower is a town square in modern Iran. Community development, often linked with Community Work or Community Planning, is often formally conducted by non-government organizations (NGOs), universities or government agencies to improve the social well-being of local, regional and, sometimes, national communities. Less formal efforts, called community building or community organizing, seek to empower individuals and groups of people by providing them with the skills they need to effect change in their own communities. These skills often assist in building political power through the formation of large social groups working for a common agenda. Community development practitioners must understand both how to work with individuals and how to affect communities' positions within the context of larger social institutions. Pseudo-community: Where participants are "nice with each other," playing-safe, and presenting what they feel is the most favorable sides of their personalities. Chaos: When people move beyond the inauthenticity of pseudo-community and feel safe enough to present their "shadow" selves. This stage places great demands upon the facilitator for greater leadership and organization, but Peck believes that "organizations are not communities," and this pressure should be resisted. True community: The process of deep respect and true listening for the needs of the other people in this community. This stage Peck believes can only be described as "glory" and reflects a deep yearning in every human soul for compassionate understanding from one's fellows. Community building can use a wide variety of practices, ranging from simple events such as potlucks and small book clubs to larger–scale efforts such as mass festivals and construction projects that involve local participants rather than outside contractors. ↑ D. Harper, Community, Online Etymology Dictionary. Retrieved August 22, 2018. ↑ John E. Tropman, John L. Erlich, and Jack Rothman, Tactics and Techniques of Community Intervention (Wadsworth Publishing, 2000). ↑ Tanya Dewey and Julia Smith, Canis lupus, Animal Diversity Web, University of Michigan Museum of Zoology, 2002. Retrieved August 22, 2018. ↑ T. Jeffrey Safari Company, African Animals. Retrieved August 22, 2018. ↑ Ferdinand Tönnies, Gemeinschaft und Gesellschaft (Leipzig: Fues's Verlag, 1912, ISBN 0887387500), 22. ↑ David M. Newman, Sociology: Exploring the Architecture of Everyday Life (Sage Publications, 2004, ISBN 978-0761988267). ↑ 7.0 7.1 Robert D. Putnam, Bowling Alone: The Collapse and Revival of the American Community (Touchstone Books, 2001, 978-0743203043). ↑ Project for Public Spaces, Ray Oldenburg. Retrieved August 22, 2018. ↑ Project for Public Spaces, Projects and Programs. Retrieved August 22, 2018. ↑ Anthony Kelly, With Head, Heart and Hand: Dimensions of Community Building (Boolarong Press, 1988, ISBN 978-0864390769). Chavis, D.M., J.H. Hogge, D.W. McMillan, and A. Wandersman. Sense of community through Brunswick's lens: A first look. Journal of Community Psychology 14(1) (1986): 24-40. Chipuer, H. M., and G.M.H. Pretty A review of the Sense of Community Index: Current uses, factor structure, reliability, and further development. Journal of Community Psychology 27(6) (1999): 643-658. Christensen, K., et al. Encyclopedia of Community. 4 volumes. Thousand Oaks, CA: Sage, 2003. Cox, F., J. Erlich, J. Rothman, and J. Tropman. Strategies of Community Organization: A Book of Readings. Itasca, IL: F. E. Peacock Publishers, 1970. Giddens, A. “Risk and Responsibility.” Modern Law Review 62(1) (1999): 1-10. Long, D. A., and D. D. Perkins. Confirmatory Factor Analysis of the Sense of Community Index and Development of a Brief SCI. Journal of Community Psychology 31 2003) :279-296. McMillan, D.W., and D.M. Chavis.. "Sense of community: A definition and theory." American Journal of Community Psychology 14(1) (1986): 6-23. Nancy, Jean-Luc. La Communauté désœuvrée. Perkins, D.D., P. Florin, R. C. Rich, A. Wandersman, and D. M. Chavis. Participation and the social and physical environment of residential blocks: Crime and community context. American Journal of Community Psychology 18 (1990):83-115. Sarason, S. B. "Commentary: The emergence of a conceptual center." Journal of Community Psychology 14 (1986):405-407. Smith, M. K. Community. Encyclopedia of informal education. Last updated: January 28, 2005. Retrieved April 22, 2008. What is community? Encyclopedia of Informal Education. Subdivided A documentary film about community featuring Robert Putnam. This page was last modified on 22 August 2018, at 22:30.